I am sure the Alison used locally-grown, organic, Devon potatoes, which is what probably “makes” this dish. I can only use what is available here in California. This will be a pale imitation of their memories of Devon. 1. Toss the potatoes in the oil and roast them at 350º F for 45 minutes to an hour. Tip: Use a small lipped baking pan. You do not want the potatoes crowded, but you do not want them scattered across a large tray either. 2. Toast the sesame seeds in a small, dry skillet for 3 minutes over medium heat, until they are lightly browned and fragrant. Set aside to cool. Tip: Remove them to a small bowl or they will burn from the residual heat of the pan. 3. When a knife slips easily into the largest potato, put them into a serving bowl. Tip: There will be sesame oil left in the baking pan. Tip the pan to drain it to a corner and toss the potatoes in the oil again to coat. 4. 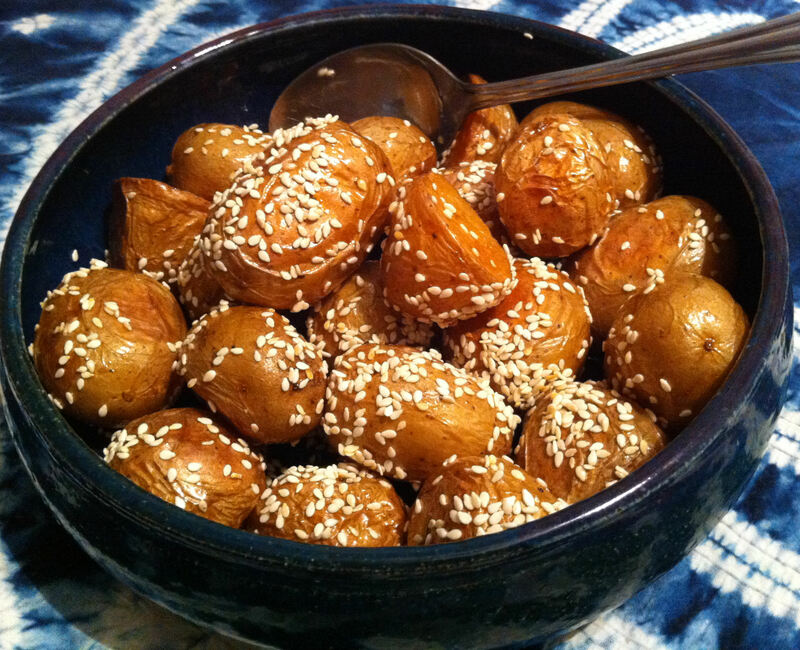 Sprinkle the sesame seeds over the potatoes and serve.